Nine to ten inches long. Black and white bands extending back from the beak across the top and sides of the head. Red patch on the back of the male’s head. Black wings with white spots in rows. White throat and underside. Straight black chisel beak. Often mistaken for a Downy Woodpecker, however the Hairy Woodpecker is larger. Inhabits forests, groves and parks throughout most of North America wherever there are trees. In winter they venture out of deep forests and often to back yard bird feeders. Its drumming is heard in forests. Braces its pecking and agile movements with strong tail feathers. Eats insects it mostly finds in bark crevices of trees. Cornell Ornithology claims hairy woodpeckers can feel a moving insect’s vibration and can also hear insects munch on wood. Lays four or five, more or less, white eggs which hatch after about two weeks incubation and young leave the nest in about another four weeks. 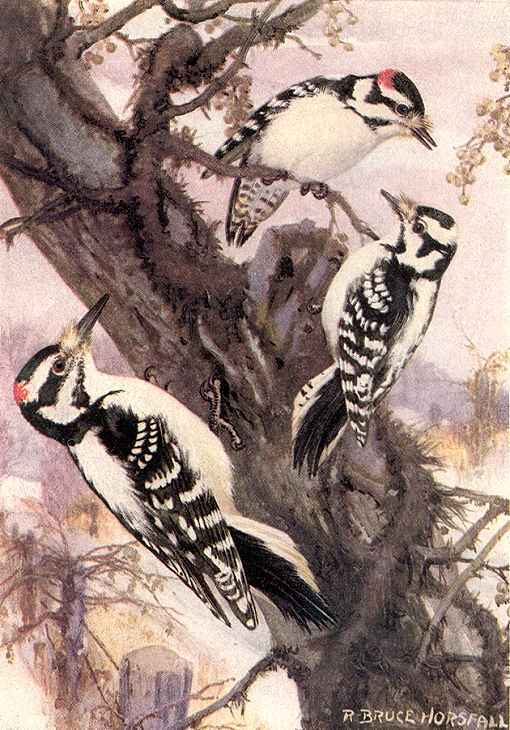 Painting shows the difference between sizes of the two downy woodpeckers and the larger hairy woodpecker, often mistaken for the former. Note the much shorter bill of downy woodpeckers in relation their head. Males may begin chiseling several holes in the fall before selecting one to inhabit. Females and males occupy separate holes until the mating season. The Hairy Woodpecker Birdhouse has a 6″ by 6″ floor, 14″ inside floor to ceiling, 1 5/8″ diameter entrance hole located 11″ above the floor and ventilation openings. Mount 12 feet or higher on a tree in a forest, forest edge, or grove. Remove everything and clean the box after the brood rearing season is past. Chickadees, nuthatches, and downy woodpeckers may also use this box. Nine to ten inches long. Black and white bands extending back from the beak across the top and sides of the head. Red patch on the back of the male’s head. Black wings with white spots in rows. White throat and underside. Straight black chisel beak. Braces its pecking and agile movements with strong tail feathers. 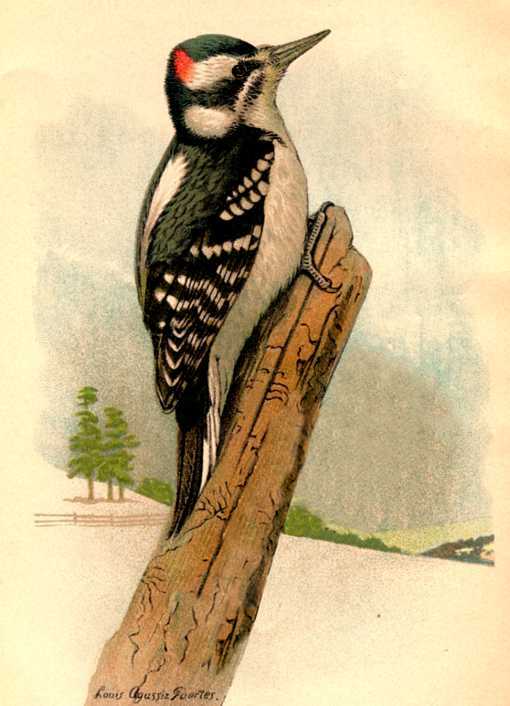 Often mistaken for a Downy Woodpecker, although the Hairy Woodpecker is larger. Inhabits forests, groves and parks throughout most of North America wherever there are trees. Its drumming is heard in forests. In winter they venture out of deep forests and often to back yard bird feeders.